What is the current state of company reporting on human rights? Are they telling us what we need to know? Which companies and sectors are leaders and laggards? Find answers to these questions in our research and analysis on the maturity of companies’ current reporting on human rights. 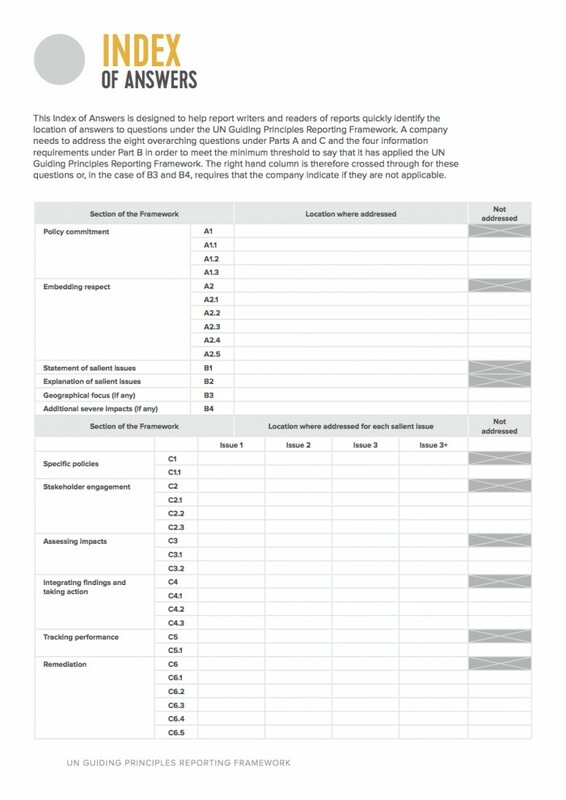 This Index of Answers is designed to help report writers and readers of reports quickly identify the location of answers to questions under the UN Guiding Principles Reporting Framework. A company needs to address the eight overarching questions under Parts A and C and the four information requirements under Part B in order to meet the minimum threshold to say that it has applied the UN Guiding Principles Reporting Framework. The right hand column is therefore crossed through for these questions or, in the case of B3 and B4, requires that the company indicate if they are not applicable. See the Index of Answers below, and scroll down to select which version of the Index of Answers you’d like to download.